Hi there Ladies. It's Tuesday which means it is time to share our drink related posts and join the T day fun. This happens every Tuesday over at Bleubeard and Elizabeth's blog. Today I am going to show some summer fun in the boat. My husband loves boats. Our boat isn't big or fancy, but we can do some exploring and have some fun summer adventures. This past Sunday (the only sunny day this weekend) we took my husband's sister and his college aged niece for a ride. His niece was really excited as she has never been out in the boat before. A toast that Ally finally gets to go for a boat ride. Of course our toast was either ice water or flavored seltzer water, depending on your choice. Sunday was very hot and ice water drinks were about the only thing refreshing. Later on we anchored the boat and went ashore for an ice cream. It was an interesting boating day. We saw one whale (no photos), a seal (no photos) and a Mola mola, also known as the ocean sunfish. I've never seen one of these in real life before. Here's what they look like from a side view if you were swimming under water. The are strangest looking fish. They are also the heaviest fish in the ocean and feed mostly on jellyfish. "Ocean sunfish that are seen in our New England waters are typically 4 to 8 feet in length, weighing 300 - 1,000 lbs. Preliminary studies conducted by the New England Coastal Wildlife Alliance (NECWA) has conducted in conjunction with NOAA's Aging and Growth Laboratory in Woods Hole, MA, indicate that the majority of these fish are juveniles who have not spawned. The large adults have been reported to be up to 10 feet in length and weigh over 2,000 lbs." Here's couple of the photos I took. They aren't as clear as the other photo because I took them looking down through the water. These fish like to bask in the sun on the upper level of water and you see their fins going in and out of the water almost like a shark fin. The only thing is their fin is floppy and not stiff like a shark fin. It was a pretty cool adventure. And here's a few other photos from the day. It was a little foggy when we started out. And before I wrap up, I want to show you a great ATC I received in the mail the other day from Eileen, The Artful Crafter. And it came with a packet of some Japanese paper and a very cool poem. There was a little stencil too but it's kind of hard to see on the paper. Thanks Eileen. It's always fun to get happy mail, as I am sure all of you would agree. And I appreciate you stopping by to visit. what a fun trip! i especially enjoyed the sunfish! reminds me of the moonfish we saw at the monterey sea aquarium 20 years ago now (!)... nature comes up with the finest creatures! What a fun post. Glad your husband's niece had a good time on your boat. The photos you shared are fabulous and the ones of that fish are out of this world. SO unique and different. Of course, the photos from the water of the land are also incredible. I really, really loved joining you with a bit of seltzer water. It looked like a great day out. Wasn't that wonderful of Eileen? I see you got to play pick up of the jalapeño peppers in your envelope, too. She certainly chose wisely on what to include. I am sure the washi paper will come in handy in your Japan journal. Thanks for sharing your day on the boat and your drink with us for T this Tuesday. Very fun post! sounds like a wonderful day on the water-and a beautiful area around the lake. Wowww Erika, those photos are wonderful!! great journey! Love the card, it ´s so gorgeous, and the poem is fabulous!! Eileen's ATC is great. I saw it on her post too. And the little poem made me smile. Sunday was a gorgeous day to be on the water. And ice cream, too. Fun goodies in the mail. Great way to start the week. Stay cool! Beautiful photos, and a beautiful atc! I had no idea sunfish grew that big...wow. I've always wanted to see a whale from a boat, that must have been wonderful! looks like a fun time, thanks for sharing it all with us ♥ happy T day! I love the water although I haven't ever been on the ocean. I grew up in boats on the lakes. There is something magical about being on the water. What beautiful photos from your boat trip, Erika! I am loving the scenery and all the unique sea life. 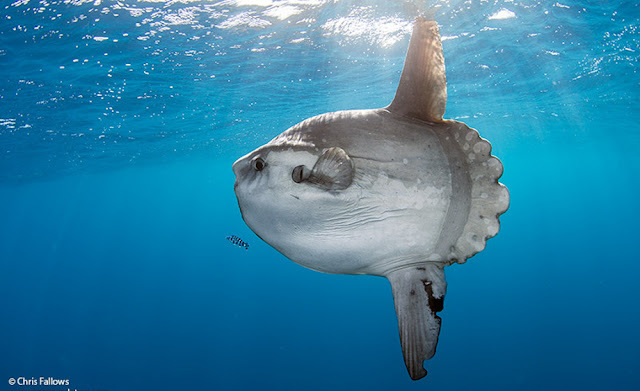 I have never heard of the Mola Mola fish but it does look interesting indeed. A bit scary if I were underwater and came face to face with that. That must have been very fun for your SIL's niece, being out on a boat for the first time. Looks like you had a beautiful day for it. Your ATC from Eileen is so lovely and perfect for tea day. I especially LOVE those papers from Japan. I bet they will look amazing in an art journal. What a lovely (and instructive day) on the water, Erika. I'd never heard of a mola mola fish. They look prehistoric. You saw a whale and a seal - what a special day. We went whale watching once. It was fabulous. We saw dolphins coming toward the bow. As they slipped under water to glide under the boat, a whale leaped over the bow. We all got soaked but it was worth it. Fantastic photos of your boat trip Erika, everyone looks so happy. The photos of the fish taken under the water look amazing it must be great getting so close to them. Its a beautiful ATC from Eileen and the goodies look lovely. Looks like you had a very cool getaway from the NH heat that’s everywhere it seems. Luckily, we have been escaping a lot of really hot weather on our cross country road trip. It’s been warm in many places, but much less than in places we’ve lived...NJ, VA and now NH. Oh what a nice day on the boat!! Looks like so much fun! I'm sure your niece had a blast! It looks like you all had a wonderful day on the water! Great photos, and Eileen's art is lovely! You do have fun, Erika, both in Real Life and in Blogland. Being on a boat in hot weather must be delightful. I absolutely love the sunfish, I might have to paint him. I love boats but it's been forever since I was on one so I'm a tad envious. What a perfect day and beautiful ports of call you passed by! Biggest sigh. Isn't summer grand?